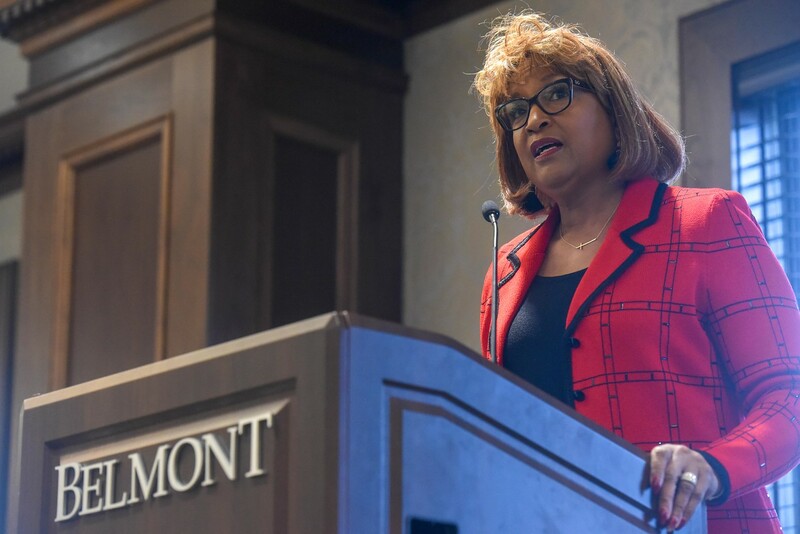 Bishop Vashti Murphy McKenzie speaks at MLK breakfast at Belmont University in Nashville, Tennessee, January 18, 2019. Bishop Vashi Murphy McKenzie, the 117th elected and consecrated bishop of the African Methodist Episcopal Church and the first woman to serve in the role, spoke to a packed crowd on Friday, January 18 as she delivered Belmont’s MLK Week Celebration Keynote Address in the Janet Ayers Academic Center Conference Room. The event began with remarks from Metro Nashville Mayor David Briley, including a proclamation from the city officially welcoming McKenzie to Nashville. Director for Athletics Media Relations Kenisha Rhone introduced the Bishop, noting her recognition by the Huffington Post last year as one of 50 Most Powerful Religious Women in the World. McKenzie began her address with a simple question – “When was the last time you took a stand for something,” she said. “For anything? For some cause greater than yourself.” Detailing the importance of finding and understanding our own convictions, principles and beliefs, McKenzie wondered if its our fears and our desire to hold onto earthly accolades that keep us from taking action against the causes that are put on our hearts. The granddaughter of a Delta Sigma Theta Founder, Bishop McKenzie’s DST sorors attended the event in their signature red.